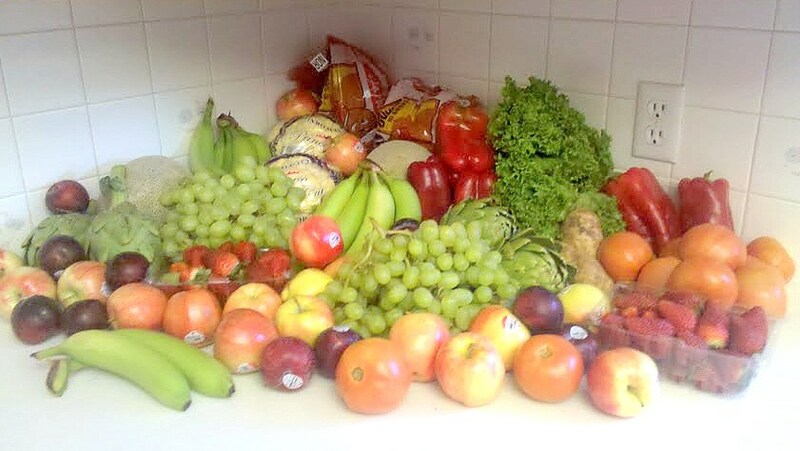 Several months ago my wife came home one Saturday morning with a couple large laundry baskets full of produce. She said it was from "Bountiful Baskets." I didn't know what she was talking about so she explained that it was a food co-op program that two women started that has now spread to most of the western states. Here's their link www.bountifulbaskets.org. You order your basket online at the beginning of the week for a whopping $15. Then you meet at your local drop off point on the weekend. You have to be sure to bring something to carry your food home in. The pickup locations are completely managed by volunteers, and it is recommended that you volunteer about 1 week out of 5 . Here's a photo of this morning's catch. This is a double order and there is much more food in the picture than it looks like. We have bags of potatoes, cantaloupe, and cauliflower buried under everything in the back. I didn't do the best job of arranging it for this photo, but you get the picture. Each week I've been impressed with how much produce she gets and how affordable it is. One of my pet peeves is how dirt cheap junk food is and how healthy foods usually costs more. More impressive than the price is the variety that they offer. It is kind of like a grab bag each week. You never know exactly what you will get when you order your basket. As a result, we've eaten a lot of great food that we normally wouldn't buy. Over the last two months, our kids have been introduced to egg plant, spaghetti squash, Brussels sprouts, artichokes, kiwi, mangoes, champagne grapes, plantains, pluots, and several other foods that I still don't know the names of. I have a big family so we usually end up placing a double order. It's been nice to see my kids excited when we bring home produce. Since the contents of the basket is always a surprise, they think it's kind of like Christmas morning. Some of them act as if we've brought home ice cream sundaes. That would never have happened when I was a kid. I wasn't into vegetables as a kid, and when my dad came home from the store with a bunch of produce, he might as well have brought home dirty diapers. Anyway, If this produce service is offered near you, or if you are familiar with a similar one, I encourage you to check it out. It is a great way to get a wide variety of healthy food at a good price. our local school use to provide something like that but its stopped. But fortunaely i have found a local farmers co-op where getting organic type eggs, fruits and veg is easy. I get irritated at how it costs more to eat healthy, too. Something is really wrong with that.